SINGAPORE: Visitors to the new library@harbourfront can relax with a book while enjoying panoramic views of Sentosa when it opens on Jan 12. Located on the third floor of VivoCity, the 3,000 sq m library is the largest to be located in a shopping mall in Singapore. “It is designed with two distinct zones – one for adults and teens and another for children – to provide conducive spaces and enhanced services that suit their reading and learning needs,” said the National Library Board (NLB) on Thursday (Jan 3). It added that the 460-seat library houses a collection of about 200,000 books, magazines and audio-visual materials. The children’s section is designed to help young readers learn through technology. In an area called Tinker Truck, there will be augmented reality books on a variety of topics to make their reading experience more interactive. It will also feature the first “maker space” in a library, aimed at developing creativity and children’s problem-solving skills through DIY learning materials, crafts and puzzles. NLB said it will work with partners to run programmes related to science, technology, engineering, the arts and mathematics on a monthly basis. To provide a more immersive storytelling experience, space has been carved out for projecting videos on all three walls of the room, using light and sound effects. 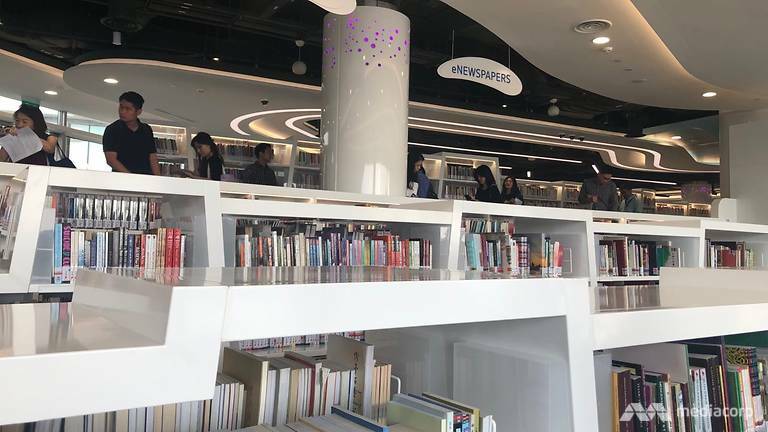 At the adults and teens section, physical newspapers have been replaced by 16 e-newspaper reading stations – the most in any public library in Singapore. Regular exhibitions on emerging technologies will be held every quarter. “Singapore is on this journey to promote a smart nation and NLB feels we can play a part to support it. We want to make technology something very easy for people to feel and touch but not in an intimidating way,” said Ms Catherine Lau, NLB’s assistant chief executive (public library services). The library will also offer weekly virtual reality sessions for visitors and provide interactive tools like Google Voyager. The adults and teens section will be run by volunteers who will help to find, recommend or shelve books. There are currently about 150 volunteers at library@harbourfront, and NLB said the number will increase. Other public libraries at Chinatown, Tampines and Bukit Panjang are also run on similar models. Retiree Ho Hew Lee, 76, said he gets great satisfaction from having volunteered at public libraries for more than a decade. When he’s not conducting digital literacy workshops, Mr Ho teaches seniors how to use the NLB mobile app and e-newspaper stations. “I’m very happy helping out seniors who are so blur with whatever they hold like smartphones. After they discuss with me, they’re surprised at what it can do and that gives me the satisfaction,” said Mr Ho. Library@harbourfront replaces the Bukit Merah public library which was closed on Dec 1 last year. It is expected to draw about 1.5 million visitors annually, three times the number seen at the Bukit Merah library.